Let imaginations run wild with great dress-up clothes! 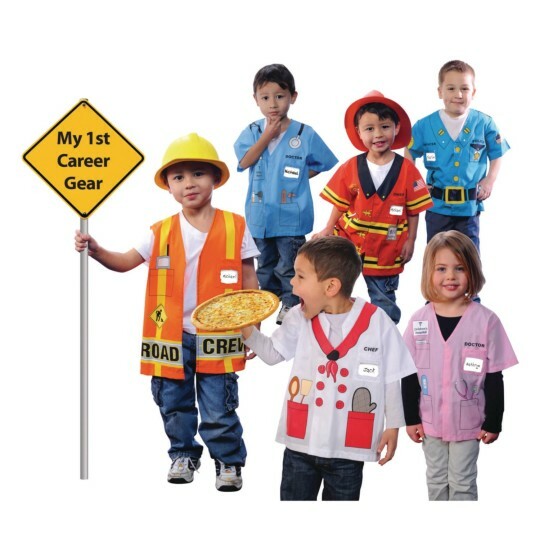 This 6-outfit role play set includes a Police Officer, Firefighter, Chef, Road Crew, Doctor (Blue Shirt) and Doctor (Pink Shirt). One-piece tops fit children ages 3 to 5 years old. Easy for little hands to put on and take off. 100% polyester, exclusive of decoration. Machine wash cold and tumble dry low. Do not bleach, dry-clean or iron. Item Care Instructions Machine wash cold, line dry. Do not bleach, dry-clean or iron. We use this in our children's area. The kids enjoy dressing up and being the characters. I bought 4 sets for my dramatic play center in my 3's classroom. The kids love them. They are easy for the children to put on and off b themselves. They help the kids get into character. Great investment!